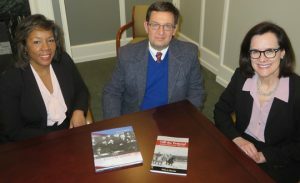 Marion Beckerink, Director of Development and Susan Murphy, Executive Director of the Robert H. Jackson Center met with John Lasher, Executive Director of the Community Foundation of Warren County to discuss the distribution of the book, Off the Pedestal to Warren County School District tenth grade students as part of Robert H. Jackson Day in Warren. The Robert H. Jackson Center held a celebration of the 125th anniversary of Justice Jackson’s birth on February 15th. The Community Foundation of Warren County was pleased to be a part of the celebration. James Johnson, the former Director of the Jackson Center, delivered a talk to the tenth grade students of the Warren County School District on the morning of February 15th. The presentation, held at Eisenhower High School, covered a wide range of topics, including Presidential powers defined in the U.S. Constitution, the separation of powers in the United States government, and international law. 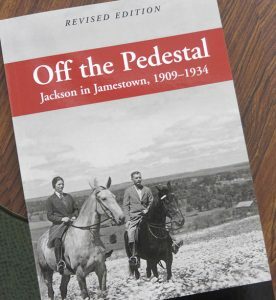 In support of the event, the Community Foundation of Warren County provided the funds to purchase a copy of the book, Off the Pedestal, Jackson in Jamestown 1909-1934, by local author Helen Ebersole, for every 10th grade student. The book offers a fascinating personal look at Justice Jackson – Supreme Court Justice and Chief U.S. Prosecutor at Nuremberg- and what his life was like when he lived and worked in Jamestown, NY. Ms. Ebersole engaged in extensive research, using the Robert H. Jackson Center and Fenton History Center archives, to uncover aspects of Justice Jackson’s life in Frewsburg and Jamestown that many would find intriguing. The book explores what influence the local communities had on Jackson’s values; his reputation as an eloquent speaker and brilliant writer; and, what experiences helped shape his world view. For more information about the Jackson Center and its programs go to www.roberthjackson.org. 2017-2018 Scholarships Available ~ Apply ONLINE Now!